It was a cloudy morning and then around mid-morning the rain began and it is still raining. There is a flood warning out for the Lumber River again. We have rain forecast for the rest of the week. The soil here is still so saturated from the previous floods that the water is just sitting on top of the ground with no where to go. Fortunately, we are not suppose to get enough rain to cause significant problems. Today since Gene and Mary Ann are here we had Gene playing is guitar and leading us in music for our morning devotion time. Thanks so much, Gene. Carol and Dave brought us another good devotion – this time from the book “If You Want To Walk On Water, You Have To Get Out Of The Boat.” Thanks, Dave and Carol, for sharing with us. Today Anne, Mike and Susan, Dave and Carol and Cindy worked at Jackie’s. Gene and Mary Ann and Bruce went back to Mary and Jim’s house. 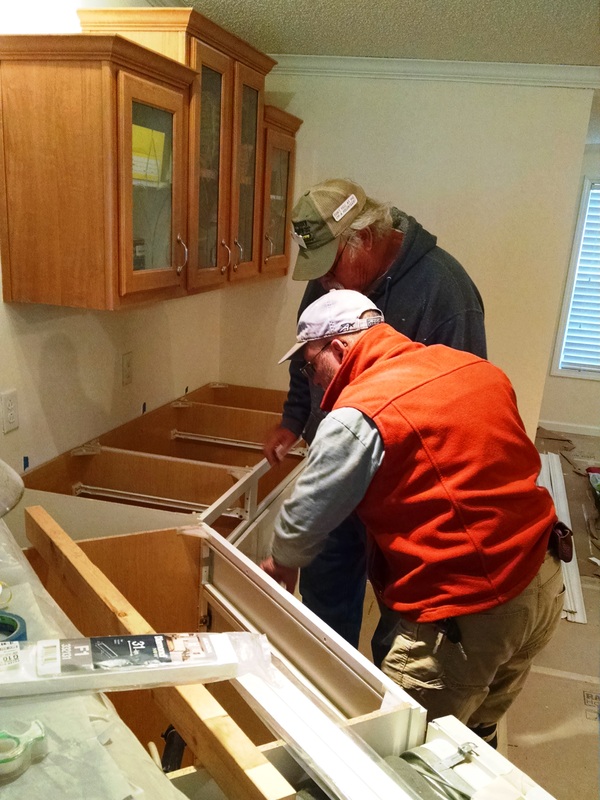 At Jackie’s we continued to work on cabinet installation, crown mold installation, caulking trim and painting trim and doors. There was also some continuing drywall work. We are making a lot of progress. At least with certain items, we have the end in sight. Over at Jim and Mary’s, work was hard because of the rain. Cutting sub-flooring had to be done between downpours. 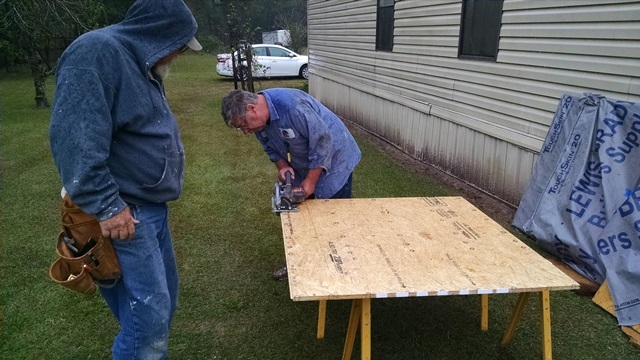 Part of the work was just done in the rain. Mary Ann worked on covering the water spots on the ceilings. She also had time to really visit with Mary. It was a good day for all. Tonight we all headed back to the Texas Steakhouse for dinner. They had some free meal specials for the veterans. Good food again and a great server. A nice way to end our day.